Join the Let's Start Building Group to receive regular updates of class details. I am currently taking a break for a few weeks from classes and will be repeating this series from late September 2008. Notices will be sent via Group Notices to let you know of future classes. Also, don't forget to check SL Events listings via secondlife.com web-page, or via inworld Search -> Events -> Education for class details. PS - if you already have some building experience, don't despair; why not try some of the advanced building classes listed in Events? I have recently discovered the wonderful world of Second Life and slowly, but surely, increased my presence in this world. After 6 months of wandering around exploring, visiting art galleries, attending classes, making friends, dancing and windsurfing, I finally found my niche in Second Life: I love to teach. Learning how to build was a daunting prospect for me; I left Help Island without having a clue about how to build! I wasn't even aware of what building in Second Life meant! It was a long, frustrating and at many times, a stressful journey until finally, one day, "the light bulb clicked". Now, I like to think that I am paying back all the wonderful (and patient) people who persevered and helped me to learn how to build from scratch. The Class Details page includes links to each week's class material and slides that were presented inworld during classes. Feel free to review the notes or if you want to clarify something I typed really badly during class :) If I still don't make sense, IM me inworld and I will do my best to respond. The Class Projects page will include the instructions on how to build the class projects. These will be posted in the days after the actual class in case you want to build it on your own time. Don't forget to join the Let's Start Building group so that you can receive all the latest class notices and group information. 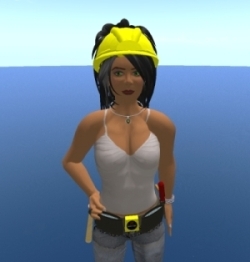 This site includes my class notes and projects that I teach for new builders in Second Life and follows the content and projects as presented inworld. In addition, I hope these will assist those of you who are unable to attend my classes in person due to those pesky time zone differences. As I live in Australia, my time zone is SLT +17 hours, with +/- 2 hours during daylight saving times :) LOL! More clean up work on the CSS for this site - needs to be prettier! Finish Advanced Textures Class notes! So, lots of busy work for me. LOL!! © Angsty Rossini, 10 September 2008.